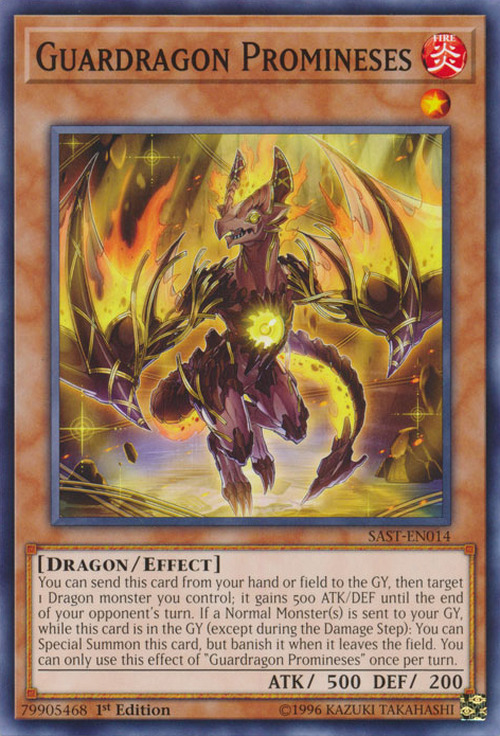 You can send this card from your hand or field to the GY, then target 1 Dragon monster you control; it gains 500 ATK/DEF until the end of your opponent's turn. If a Normal Monster(s) is sent to your GY, while this card is in the GY (except during the Damage Step): You can Special Summon this card, but banish it when it leaves the field. You can only use this effect of “Guardragon Promineses” once per turn. This card's name is a portmanteau of prominence and genesis.